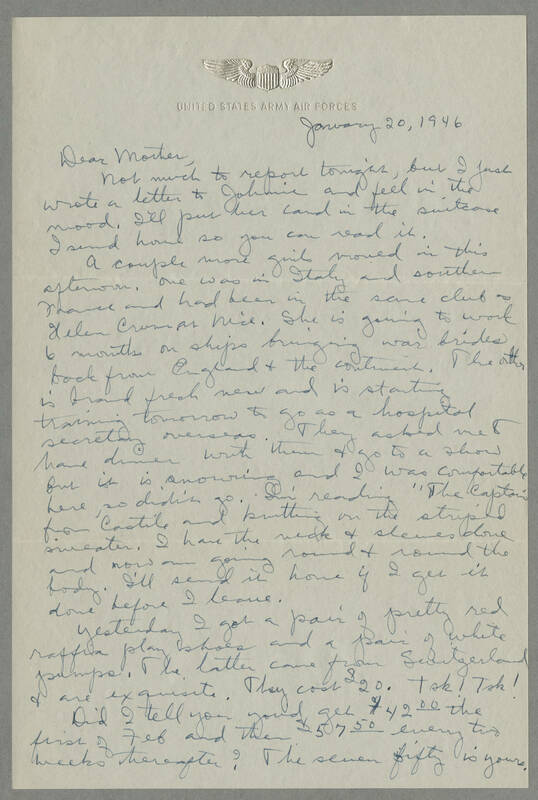 January 20, 1946 Dear Mother, Not much to report tonight, but I just wrote a letter to Johnnie and feel in the mood. I'll put her card in the suitcase I send home so you can read it. A couple more girls moved in this afternoon. One was in Italy and southern France and had been in the same club as Helen Crum at Nice. She is going to work 6 months on ships bringing war brides back from England & the continent. The other is brand fresh new and is starting training tomorrow to go as a hospital secretary overseas. They asked me to have dinner with them & go to a show but it is snowing and I was comfortable here, so didn't go. I'm reading "The Captain from Castile" and knitting on the striped sweater. I have the neck & sleeves done and now am going round & round the body. I'll send it home if I get it done before I leave. Yesterday I got a pair of pretty red raffia play shoes and a pair of white pumps. The latter came from Switzerland & are exquisite. They cost $20. Tsk! Tsk! Did I tell you you'd get $42.00 the first of Feb and then $57.50 every two weeks thereafter? The seven fifty is yours.